I thought once I had published my book on marketing that small business owners would be flocking to me dying to know more about all the best marketing advice I offer in the book on marketing plans and strategic marketing. Or perhaps, I thought, they would want to know about all the great tactical stuff I included or maybe, just maybe, they’d want to find out what I didn’t put in the book! Sure people are buying the book, reading it, applying it and so far the overwhelming majority of readers are giving this small business marketing book a 5 star Amazon rating, which indeed makes me smile! But by far, the most popular question small business owners have been asking is how I started writing the book. Followed by “How long did it take?” I’ve discovered a lot of small business owners out there are interested in writing their own story or sharing their business success formula! What’s cool is because I’m accessible to them, they can ask me those questions and I do whatever I can to inspire and encourage them because writing your own book is really rewarding (on most days). The trouble with most business owners who want to author a book is they’re really busy people and are the same individuals who’ve used the excuse they’re too busy to blog, and yet, they want to undertake something even more time-consuming like creating an entire book or manifesto! I will be the first to encourage anyone, but you and I both know that most people cannot just sit down and crank out chapter after logical chapter of all it is we know about a particular subject. If that were true everyone would be an author and that’s just not the case. Most aspiring writers will sit down, type a few paragraphs, get distracted and take a phone call, forever derailing them from the task at hand. Then, the idea will hit them that they need to get out of their house and they’ll find the nearest coffeehouse all geared up to light up their laptop keyboard while sipping some java only to run into a few friends who plop down to chat. Having accomplished nothing the would-be writer grows frustrated and discouraged because the book didn’t just materialize all on its own. Yes, that’s right, just begin getting all of that fabulous knowledge out of your head and onto paper, or onto the screen as it were. Do it in chunks, one topic at a time – one blog at a time. You can write as things come to you or select themes for each month to keep you focused. Many chapters of Marketing Chomp actually came from blogs I wrote when I first started up my company. When I got serious about writing a book I had three years of material to draw from. I found all sorts of great stuff that I could use or re-purpose which was really exciting because it was less I had to write from scratch. By starting a blog you start carving out time to write and the more you write, the better you will become at writing. By starting small you will get the hang of creating a short, easy-to-read copy which is absolutely essential today. The other piece of that is you’ll create some easy wins for yourself. Writing is a lonely business and as a writer, you’ll find you require lots of encouragement because there will be days, even weeks where you will question everything you wrote and will become weary with words and disheartened in your entire dream of becoming an author. Creating a blog will help you develop some mental toughness because when no one reads it, instead of getting all mopey, you can simply remind yourself this is a stepping stone for a bigger task. And finally, writing a blog week after week after will create the habit of writing and editing which are both essential components for completing an entire manuscript. 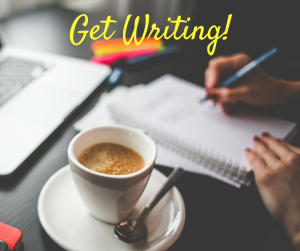 There’s certainly so much more I can share on the topic of writing your book, but guess what? I’ll write about that in a future blog! Aha! Did you pick up on what I’m doing? Are you beginning to see how this can work for you and your topic? I hope so! You’ve decided to start? Superb!! Now how do you write best? Do you need a cup of coffee? Do you need noise or quiet? Do you even know? You will figure out your best writing environment and creative process once you start, but you can’t refine your process or ever publish a book if you don’t START writing. What are you doing? Stop reading! Go on, git . . . start typing! !